On December 18th, Saab Automobile filed for bankruptcy, bringing its 64 year offbeat history to an unfortunate end. Saab enthusiasts are some of the most vocal and most possessive of their brand, and undoubtedly, they will mourn the loss of this name. 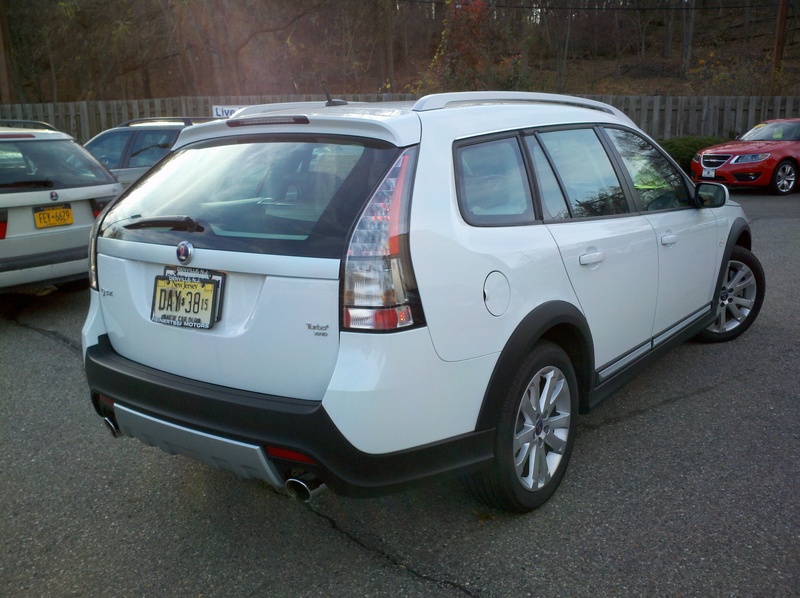 Around Thanksgiving weekend, I decided to add another car to my wagon test–Saab’s own wagon, the 9-3 SportCombi. 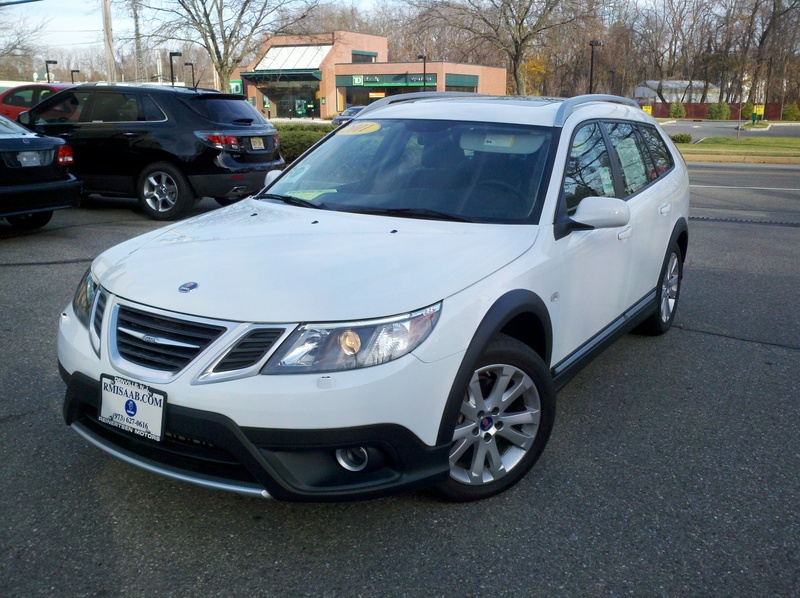 At the moment, it’s the only wagon Saab sells in the United States, and when I got to the dealer, the car I drove was already discounted by $9,000. This amount is no misprint–and any new car marked down this much is either a demo, or the dealer seriously needs it off the lot (in this case, the latter). But, when I started the engine, I forgot about Saab’s financial woes, and asked myself this question: Despite all the gloom and doom, is this car actually worth buying right now? The 9-3X is a fairly new model in Saab’s lineup, and is a direct competitor to the BMW 3-Series wagon and the Audi A4 Avant. It undercuts both on price and is FWD-based (similar to the Acura TSX), but unlike the Acura, is available with all-wheel-drive. The Saab’s system is supplied by Haldex, and was designed in 2008 by Saab themselves, making its debut in 2008 on the Saab 9-3 TurboX. Under the hood lives a 2.0L inline-4, putting out 210hp with the help of a turbocharger (similar to the Audi). It looks like a typical Saab wagon, except with Pontiac-level amounts of body cladding on the lower part of the doors and the fenders, not an attractive addition. The rest of the car is easy on the eyes, though. This particular test car wasn’t optioned heavily, with the Premium Package and a few small options as the only ones on it. 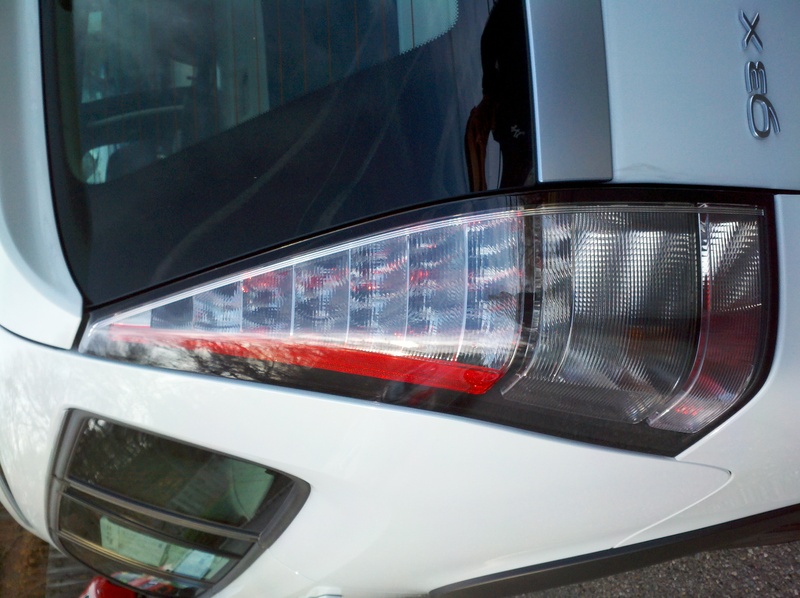 The taillights look very cool, but this one looked like it wasn’t fitted quite right. The build quality was a little iffy, with some scratches on the new fenders and a messily-installed taillight. On the inside, though, things were better, if a bit dull. Everything’s the same color (black) with a bit of fake-aluminum on the steering wheel. The quality of the materials was acceptable for the discounted price, but could definitely be better for what their list price is. The interior layout is a departure from the other European and Japanese premium wagons, with very conventional knobs and dials for the radio and for the HVAC controls. This is a nice touch, and makes the interior friendlier to those averse to “form over function” designs. Everything is easy to read, and nothing feels like it’s misplaced. That said, it definitely feels a step backward on quality (a feeling of GM pervades it). For 9 grand off MSRP, this interior represents probably the best part of the car. 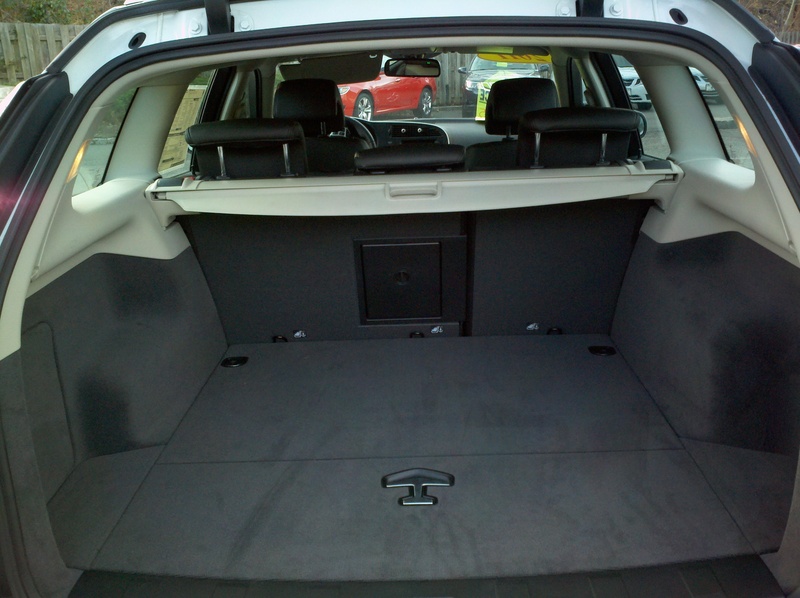 Needs more rear seat room, but everything’s easy to see and understand. 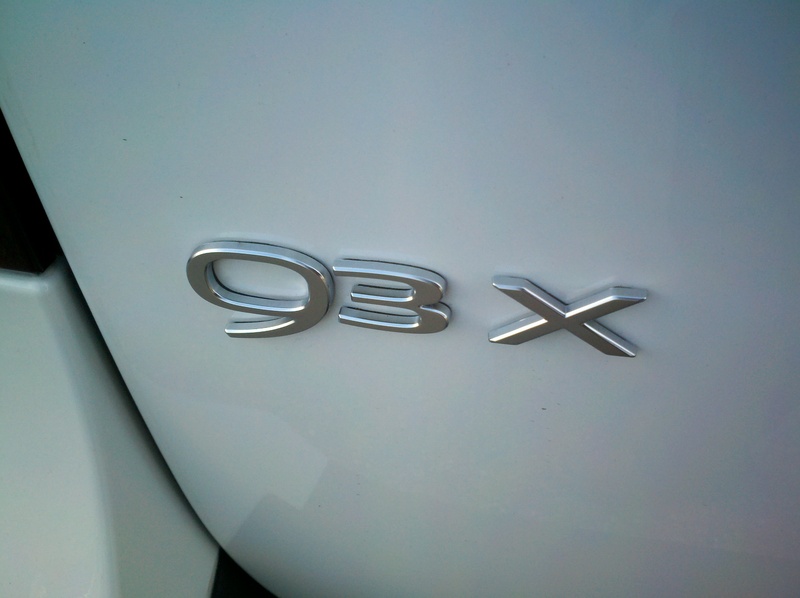 On the road, the 9-3X is firm and still comfortable, without a lot of serious issues. Tire roar is evident, and the engine, a turbocharged 2.0L plant, is uncivilized (Audi’s identically-sized turbo four is much nicer to listen to at speed) yet provides enough low and high-end grunt for most situations. Visibility is a plus (as Saab is obsessed with driver safety, not much is placed in the way of the driver’s view). 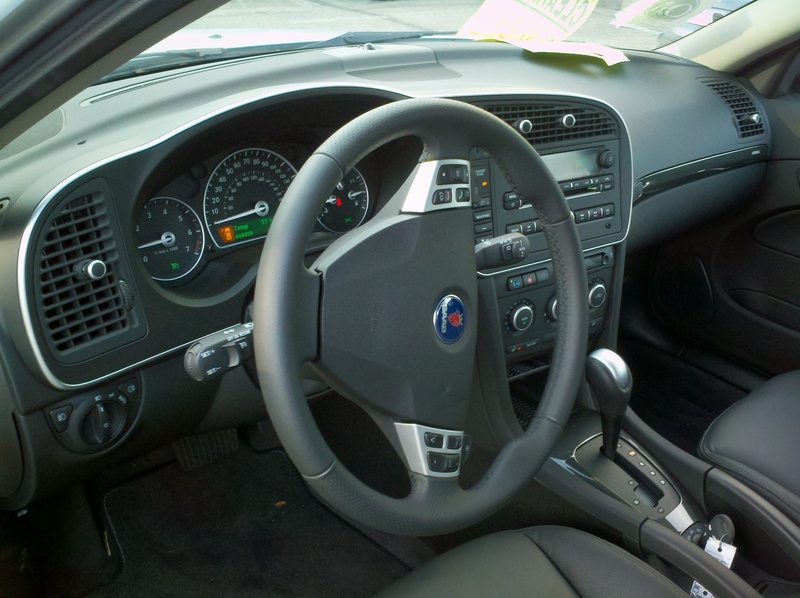 The transmission is best left in Automatic, as the paddle shifters Saab provides aren’t exactly the best in their operation or placement. The transmission still does hunt a bit between gears, muddling the power delivery. Around corners, the steering feel is decent but nothing truly exciting. The 9-3X also feels heavier in corners than the competition. It’s not an entirely awful little wagon, but it doesn’t do anything spectacularly well. One big drawback, strangely, is interior room. The dark material color lends a sense of being a bit trapped, and the seats, while comfy, are fairly thick and invade rear-seat room. In fact, with a 6-foot passenger up front, my 5-foot-5 frame was very uncomfortable, something that the other wagons were admittedly better at. But, there’s more. The cargo room is decent but the opening is a bit narrow. With the discounted price taken into account, the 9-3X at about 32 grand is a great value for the money on paper, offering a good number of features for a price close to the TSX, along with the all-weather capability of AWD. But, a closer look reveals an aging platform with some refinement issues compared to its brothers at Audi, BMW, and Acura. Until December 19th, I would have recommended this wagon if it were offered at a significant discount (which at this moment, it still is). But at this point, I can no longer steer you towards a 9-3X SportCombi, or any other Saab. You see, that day, Saab announced that they will not honor any new car warranties on a Saab vehicle purchased, whether it be the bumper-to-bumper warranty, roadside assistance, or powertrain coverage. Although GM stepped in a few hours after the announcement to say they will still cover the Saabs purchased under GM’s ownership, this still leaves anyone who purchased a 2010 or 2011 model utterly out of luck, and the money saved on the initial purchase (fire-sale prices are everywhere right now) will certainly go to repairs and work that would normally be covered under the warranty. Because of this, I simply refuse to recommend one (or any other new Saab).